Participant payoffs through Amazon Mechanical Turk can be divided into two parts. While creating a HIT (Human Interaction Task) a fixed reward can be specified. Every participant will get this reward after your approval, regardless of their performance within the experiment. This is mentioned on the screenshot of the user interface as well. In addition to the fixed reward a bonus payment can be approved to each participant individually, based on their performance. These payments are calculated through the payoff methods mentioned earlier and they are additional to the fixed reward every participant receives. 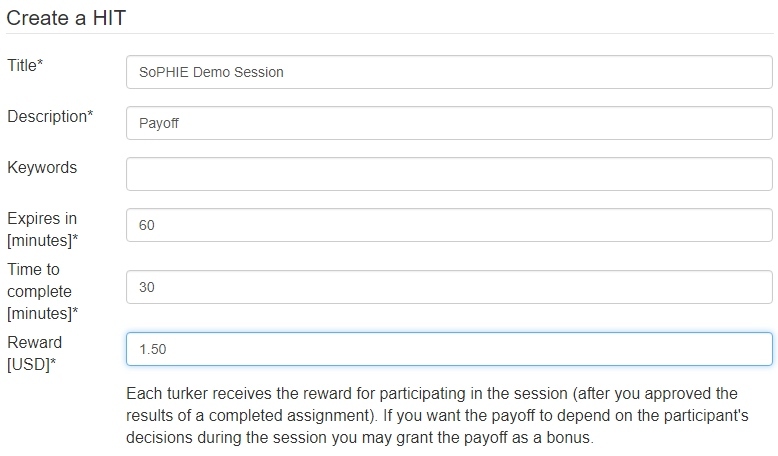 The bonus payoffs are shown as a suggested bonus within the MTurk Payoff tab, where submitted assignments are shown and payments can be approved. Below you can see the interface, where individual participants can be approved or rejected.